Despite the tent's somewhat cramped quarters, I slept pretty well overnight. I had wanted to get an early start, but did not feel motivated to get up. My sleeping bag was comfortable, and I dozed on and off, enjoying the silence. Eventually the thought of a cup of coffee prodded me out of the tent and over to the tree where my food was hanging. Besides a spoon/fork combo utensil, the only dish I had brought was my aluminum mug. I had been using a Guyot squishy bowl and cup set, but found that they were retaining food smells during my last trip. After enduring days of a lingering garlic smell that permeated the food bag and tainted whatever I ate, I decided that I could get by with one metal cup. I ate oatmeal from it before preparing a hot cup of Starbucks Via, which helped unstick the oatmeal dregs from the cup in addition to waking me up. I left my campsite at Popple around 9:45 am and headed back to the lakeshore to begin my day's hike along the beach. Following the water's edge along South Manitou Island's west side, it is a seven mile walk to Weather Station Campground at the south end of the island. Hiking alone might sound lonely to some, but this is what I was here for. I had a whole day to walk a seven mile stretch of nearly deserted Lake Michigan beach. The weather was perfect; an occasional wispy cloud decorated the blue sky, and the constant wind blowing from the lake kept the relentless sun from feeling overwhelmingly hot. I could spend as much time as I wanted taking in the views without having to be concerned with another person's agenda or level of interest. I had gotten away from everything, and my time was purely my own. I followed the curve of the island's northwest corner and was amazed at the beautiful stretch of lakeshore in front of me. I would think the same thought over and over during my hike that day: 'this is perfect.' I could not have imagined a more perfect way to spend a day, let alone my first solo backpacking experience. 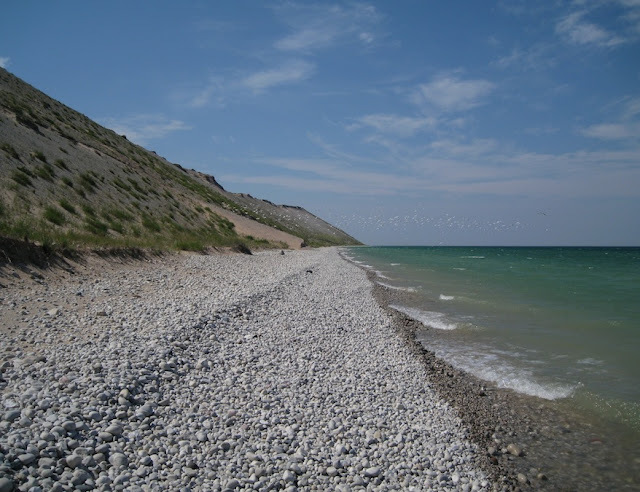 In Jim DuFresne's excellent hiker's guide, Backpacking in Michigan, he describes this stretch of shore as follows: “At one point the perched dunes rise 425 feet from Lake Michigan. 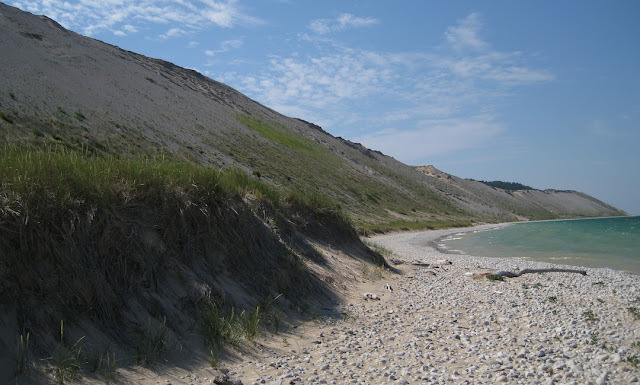 These spectacular dunes make up the entire west shore of South Manitou. Only Sleeping Bear Bluffs across the Manitou Passage on the mainland are higher and more dramatic. Those perched dunes, however, are crawling with tourists most of the summer. Out here, you're by yourself, in what feels like the edge of the world. Or at least the edge of Michigan.” His sentiments are 100% accurate. I must have stopped every 20 feet to take a photo. The colors alone were fascinating; the different shades of the blue/green water, the khaki sand, the green dune grass, the blue sky – although I have a lot of experience with the beauty of the Great Lakes, it never fails to amaze me. The feeling was slightly otherworldly, like I was visiting some dramatic and remote planet on Star Trek. Great dunes rose hundreds of feet above me on my left, an endless expanse of blue water stretched away on my right, and the shoreline ahead and behind me was made up of angles where these features met, curving in and out for miles. I could not believe that no one else was here. It is amazing what a little walking can reveal to someone who is willing to get off the beaten path. The hiking itself was easy, starting out with solid terrain where the sand was damp and hard-packed near the water's edge. This changed after a little while and became a bit hard on the feet, with the beach alternating between dry sand and loose rock (or sometimes a combination of both). Although these conditions can be cumbersome to walk through, the terrain was flat, with no elevation gain or loss. With so much constant, direct sun, I was sure to apply plenty of sunblock. Mosquitoes were not an issue, and the wind coming off the lake was strong enough that the biting flies that are sometimes annoying along the lakeshore were not able to linger long enough to be a problem. Zebra mussel shells were unfortunately common along the beach, and occasional huge mounds of them were shocking evidence of the prevalence of this invasive species. Occasionally, one would somehow make its way into the ankle of my boot, slicing through wool hiking socks and skin as I walked. Invasive jerks. I watched a freighter far out on the lake disappear behind the southwest corner of the island. As I approached this corner, the beach became rockier and a bit more rugged-looking. The dunes of the mainland several miles away became visible in the distance, and those towering on my immediate left became much greener with vegetation. Dune grass blanketed the sandy slopes, and trees clung at various angles above me. Somehow, this corner of this island was even more beautiful than everything I had seen before it. Boulders littered the turquoise shallows, and the steep green slopes gave me the impression of being somewhere far more exotic than the American Midwest. Enhancing this feeling, the remains of a shipwreck jutted out of the water approximately 100 yards offshore. According to Manitou Islands Archives, over 130 ships have been lost in Manitou Passage since the mid-1800s. The Francisco Morazan is a fairly recent shipwreck; it ran aground during a snowstorm in November, 1960. All aboard were rescued, but the ship was not so lucky. It was at the beach directly across from this shipwreck that I finally began to see other people – five miles from the start of my hike. Since rounding the southwest corner of the island, I had lost the westerly wind, and it was much hotter without its constant cooling influence. The water near shore was fairly rough, but beachgoers were swimming as well as lying on the sand and soaking in the intense sun. I spoke with a couple of guys on the beach who had swum out close to the shipwreck. They reported that it smelled terrible near the ship's remains, and the cormorants guarding it tried to chase them off, so they returned to shore before actually reaching it. Once I rounded another bend and was out of view of the shipwreck, I took a break and ate a snack of Wasa crackers and Babybel cheese. Just under two miles ahead, a series of five paths lead up the bluff to Weather Station campground. As I climbed up one of these short paths to reach the main trail through the campground, I was shocked at the change in temperature. Halfway up the bluff and into the woods, the temperature rose drastically and suddenly, as if I had passed through an invisible barrier. Luckily, I managed to find a campsite near the edge of the bluff overlooking the lake instead of ending up further back in the woods. Once again, a steady breeze kept my campsite comfortable and bug-free. There was, however, poison ivy everywhere. The perimeter of my site was safe, but poison ivy lined many of the paths, almost as if it had deliberately been used in landscaping. I cringed every time I saw someone walking a path barefoot, either going to or returning from the beach. Many of the people I spoke with admitted they didn't know what poison ivy looked like. My campsite at Weather Station. My proximity to the beach ensured I met several people, and I enjoyed sharing stories with a few interesting characters I met as they wandered the path near my campsite. I learned from nearly everyone I spoke with that the full moon I had missed the night before had been spectacular. Weather Station is more of a social campground than I would normally stay in; however, almost everyone was either at the beach or day hiking, so there wasn't much activity or noise, and I spent the whole relaxing afternoon reading. I saved the good stuff for tonight's dinner: Mary Jane's Farm ChiliMac and a mini bottle of merlot. 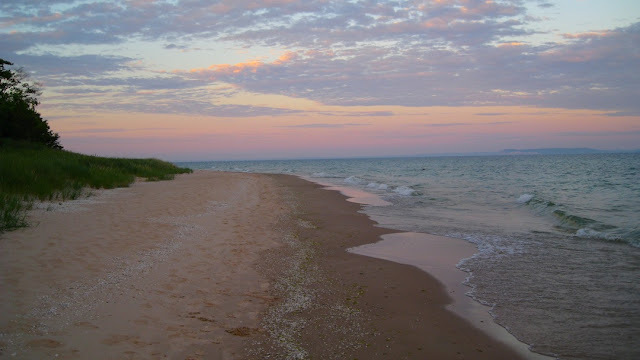 Around sunset, I walked east along the beach to South Manitou Lighthouse, approximately 1.5 miles away. It was the perfect time to observe the lighthouse; the waning light cast a soft purple glow on everything, and not a single person was there, which surprised me. I think everyone was exhausted from climbing dunes and being in the sun all day. The seagulls around the lighthouse were not happy with my presence and made their feelings known, flying around above me and screeching loudly. Once the sun went down completely I began to walk back, hoping I would be able to return by the light of the moon. After a few minutes the moon began to rise from the lake, huge and glowing red, and I got my camera ready. Just as it emerged fully from the horizon, it slipped behind a cloud and that was that. I walked back in the dark, against the wind, with my headlamp on and thousands of gnats pelting me in the face. I have a belief that the good things encountered while hiking always have a price – a scenic overlook requires a steep climb, a waterfall in the woods means being eaten alive by mosquitoes, a nice downhill stretch of trail means an uphill trudge is sure to follow, etc. I think this was my belated price for having such a great day. All in all not a bad deal, although my face felt like a battered windshield by the time I returned to the path leading up to my campsite. I saw a couple of toads on my nighttime walk and a few garter snakes throughout the day, but this was the extent of the day's wildlife sightings. It is a testament to the good time everyone must have had on this perfect summer day that no one bothered to use the community fire ring located near my campsite. I was sure that at least a few people would gather around to toast marshmallows and talk about their day's adventures, but it seemed everyone had gone to bed early. The campsite was totally silent, and I laid in the tent reading for quite a while before falling asleep. I awoke during the night and the brightness outside indicated the moon must have found its way out of the clouds and was undoubtedly reflecting brightly over the lake, but I could not drag myself out of my sleeping bag to look. Another opportunity ignored in favor of sleep. Sweet! It sounds like a lovely trip. The solitude and distance from civilization sounds wonderful. Reading this finally convinced me to get off my bum and plan a labor day weekend backpacking trip... I can't wait! I love your blog and I wish you would post more often..I hope you are ok and have just been too busy to hike and post. Thank you for your comment. Yes - unfortunately, I have been too busy for a while for any trips. I recently got a new job and have been taking a few classes in the evening, and I just couldn't make it happen. Things are settling down now, so hopefully this year will be different!